Ambon was a governorate of the Dutch East India Company, consisting of Ambon Island and ten neighbouring islands. 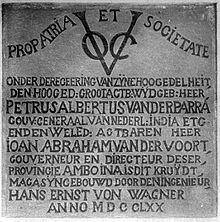 Steven van der Hagen captured Fort Victoria on 22 February 1605 from the Portuguese in the name of the Dutch East India Company. Until 1619, Ambon served as the capital of the Dutch possessions in East Asia. 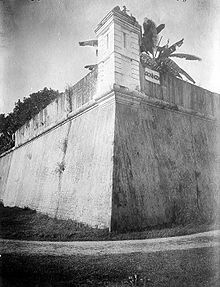 In that year Batavia was founded to function as the staple port for the Dutch East India Company in Asia. Ambon was the site of the infamous 1623 Amboyna massacre. The island used to be the world center of clove production until the 19th century. The Dutch prohibited the rearing of the clove-tree in all the other islands subject to their rule, in order to secure the monopoly to Ambon. In 1513, the Portuguese were the first Europeans to land on Ambon Island, and it became the new centre for Portuguese activities in Maluku following their expulsion from Ternate. The Portuguese, however, were regularly attacked by native Muslims on the island's northern coast, in particular Hitu, which had trading and religious links with major port cities on Java's north coast. They established a factory in 1521, but did not obtain peaceable possession of it until 1580. Indeed, the Portuguese never managed to control the local trade in spices, and failed in attempts to establish their authority over the Banda Islands, the nearby centre of nutmeg production. The creole trade language Portugis however was spoken well into the 19th century and many families still have Portuguese names and claim Portuguese ancestry. The Portuguese were dispossessed by the Dutch on 22 February 1605, when Steven van der Hagen took over Fort Victoria without a single shot. Ambon was the headquarters of the Dutch East India Company (VOC) from 1610 to 1619 until the founding of Batavia, now Jakarta, by the Dutch. Around 1615, the English founded a settlement on the island at Cambello, which they retained until 1623, when it was destroyed by the Dutch. Frightful tortures inflicted on its unfortunate inhabitants were connected with its destruction. In 1654, after many fruitless negotiations, Oliver Cromwell compelled the United Provinces to give the sum of 300,000 gulden, as compensation to the descendants of those who suffered in the "Amboyna massacre". In 1673, the poet John Dryden produced his tragedy Amboyna; or the Cruelties of the Dutch to the English Merchants. In 1795, the Batavian Republic was established with the help of French forces in the territory of the Dutch Republic. The latest stadtholder, William V, Prince of Orange asked the British in the Kew Letters to temporarily occupy the Dutch colonies. Indeed in 1796, British Admiral Rainier sailed to Ambon to take the colony, which was accepted by governor of Ambon, Alexander Cornabé. The territory was restored to the Dutch at the Peace of Amiens in 1802, but the Dutch East India Company had been nationalized in the meantime, which meant that Ambon become a colony of the Batavian Republic and later the Kingdom of Holland. Ambon was retaken by the British in 1810, but once more restored to the Dutch by virtue of the Anglo-Dutch Treaty of 1814. It then remained, as part of the Dutch East Indies, a colony of the Kingdom of the Netherlands, until in 1949 Maluku was transferred to Indonesia, under agreements that Moluccans could choose or opt out of the new country. ^ "Amboina". De VOC site. Retrieved 4 February 2013. Ricklefs, M.C. (1999). A History of Modern Indonesia Since c.1300 (2nd ed.). London: Macmillan. pp. 25, 28. ISBN 0-333-57689-6. This page was last modified on 29 September 2015, at 04:38.